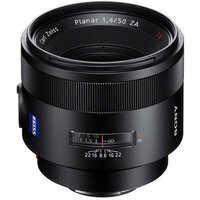 The Sony f1.4 ZA Zeiss Planar Lens is an A-mount, fast, prime lens with a bright f1.4 aperture and is an ideal choice for portraiture and low-light shooting. Featuring 8 elements in 5 groups with two aspherical elements, the optical design optimised for superb results with Sony's full-frame SLT/SLRs. The 50mm f1.4 is a portable lens that maintains the same lens body length during AF and offers smooth, quiet focusing and exceptional contrast at all apertures. This ZA (Zeiss Alpha) lens includes many optical coatings to ensure the best image and build quality and is manufactured by Sony to Carl Zeiss specification.